No trip to Milan is complete without visiting Leonardo Da Vinci’s Last Supper, one of the world’s most renowned and mysterious works of art. Admiring this masterpiece is a unique experience…but it’s not something you can do last-minute! The easiest and more informative way to see it is with our small-group tours led by an expert guide. But if you want to go it alone, we’re all for that, so here are 4 things you should know before planning your trip to the Last Supper in Milan! 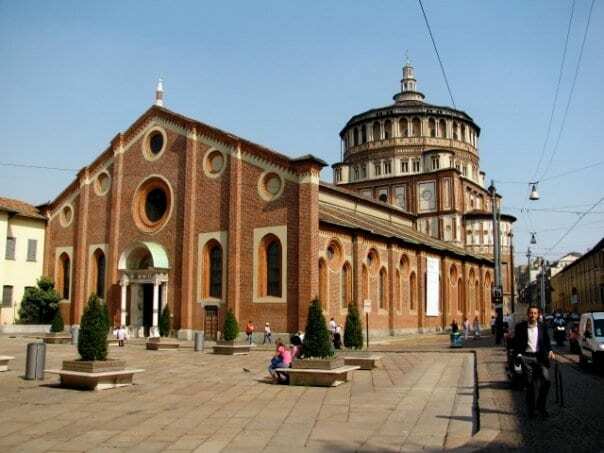 Contrary to popular belief, the Last Supper is not located in a museum: It’s in the Santa Maria delle Grazie church and convent. The work (located in the dining room!) was commissioned by Ludovico Sforza, Duke of Milan, and was believed to be completed between 1495 – 1498. …but it’s very easy to reach. Luckily, getting to Santa Maria delle Grazie is easy! Take the red MM1 subway line to the Conciliazione stop or the green MM2 to Cadorna,where you will see directions for the “Cenacolo Vinciano.” From there, follow the populated Corso Magenta street to the Santa Maria delle Grazie church. The Last Supper can also be reached from the Stazione Centrale (Central Station) with five stops on the green line, or by a 20-minute walk from the Duomo. (Don’t miss our guide to public transport in Milan to get the hang of how it all works!). Da Vinci painted the large 15ft-by-29ft piece directly on drywall. That means it’s technically not a fresco (which would be painted on wet plaster). …which means it’s deteriorating, quickly! 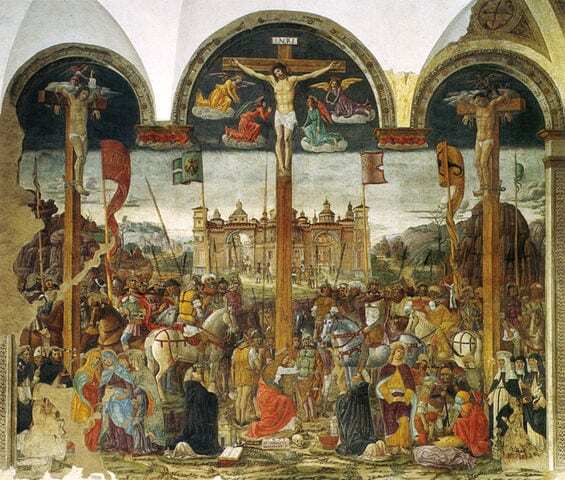 Da Vinci took the unique step of laying pitch, gesso and mastic on the wall, then painting with tempera over it… a method called fresco-secco that meant the painting started decaying within years of being finished. Nope, you can’t just stroll in to see the Last Supper: Instead, tickets must be reserved. Ticket dates are released approximately four months in advance and can be purchased online or by phone at +39 0292 800360. The cost is 6.50 euro, plus a 1.50 euro service charge. Typically, appointments can be scheduled Tuesday to Sunday from 8:15am to 6:45pm, but in occasion of the 2015 Milan Expo the hours have been extended from 8:30 a.m. to 10:00 p.m. Thursday through Sunday and from 6:30 p.m. to 10:00 p.m. on Monday from May 1, 2015 until October 1. Tuesday and Wednesday hours remain the same as before. We highly suggest booking as early as possible to guarantee admittance to one of history’s most important works of art! And if you’re booking last minute or can’t find tickets for your desired date, there may be a chance at organizing a visit! We suggest periodically checking the website or calling the hotline to snag tickets from a canceled group or individual reservations. Tickets are sometimes for sale the same morning by waiting in line before the first appointment at 8:15AM, but are rarely available. Donato Montorfano’s Crucifixion, displayed across from the Last Supper. …and you’ll have only 15 minutes to admire Da Vinci’s work. The downside: No matter how far in advance you book, you’ll still have only 15 minutes in front of the painting. That’s not much when it comes to observing one of the Renaissance’s most famous works (not to mention one that has launched countless conspiracy theories, movies, and novels!). To make the most of your time, consider booking our private Last Supper tour, which lets you experience the painting with an art history expert to bring it to life. And whether you go with a guide or not, make sure to arrive at least 10 minutes prior to your scheduled time (any late visitors will not be allowed entrance!). Also, remember that large bags are not permitted in the museum area of the church and appropriate clothing (shoulders and knees covered) should be worn during the visit. Photographs are strictly forbidden to preserve the delicate painting. Have you seen the Last Supper? What did you think? Tell us about your experience in the comments! Yes we visited Milan last month and the tickets were booked well in advance for our trip from Australia. I’d read about the deteriorated state of the painting so didn’t feel disappointed when I saw it. Yes getting locked in for the 15 mins I think made it even more special as only about 20 or so were in there. There are seats and a clear view to relax and take in the splendour of this masterpiece (try looking at the Mona Lisa with all those crowds in front of it) I felt lucky to have seen one of the wonders of the art world, thanks for looking after it so well Milan.